Looking at the Yamhill-Carlton District AVA map, you see it's a horseshoe shape with western, northern, and eastern flanks. Most if not all of this AVA shows the typical rounded hills of sedimentary soils, unlike the steeper volcanic slopes of places like the Dundee Hills, much of the Chehalem Mountains, and Eola-Amity Hills. The soils are important at least because of what they lend to their wines. I find that the sedimentary soils give a darker fruit character to the Pinot Noir, as opposed to the red fruit that seems to predominate in the wines from volcanic soils. That's conventional wisdom to some, but heresy to others, including many experienced winemakers, who suggest that red and black fruit flavors reflect degrees of ripeness in wine grapes. Less ripe tending to the red, more ripe to the black. The issues isn't settled, that's for sure. The Yamhill-Carlton District is elevation-based, so that the AVA begins at the 200 foot elevation rising to 1000 feet. The rationale is that the particular soil types in the AVA are distinguished from the fertile valley bottom soils that are not ideal for growing high quality vinifera grapes. Learn more about the AVA here. From the western flank, which is just north of the McMinnville AVA, we first find a scattering of coast range vineyards. Are these actually volcanic soils? I'll have to find out. Moving north, we find the large Gran Moraine vineyard of Premier Pacific Vineyards, famous (or infamous) for being an investment of pension money from state workers in California. This is an interesting site, due west of the town of Carlton and immediately next to the well regarded Resonance Vineyard. To the north, we find another wide scattering of planted sites, some with familiar names, others obscure. Lazy River makes its wine (and I believe is a partner in) the Carlton Winemakers Studio. Elk Cove's Mount Richmond Vineyard has long produced a single vineyard bottling. The Estate Vineyard of Elk Cove is further north, along with the long planted but not always highest quality Kramer Vineyard. To the northeast, notice ADEA, with a small vineyard at low elevation right off Route 47. Also, Elvenglade, perhaps one of the more interesting sites for Pinot Gris. Outside the AVA to the north are the well regarded Patton Valley Vineyards and the isolated but beautiful Cancilla Vineyards of Ken Cancilla, an old acquaintance who's making good wine. Then to the eastern flank of the Yamhill-Carlton AVA. From north to south, the first cluster of sites contains the Beacon Hill Vineyard, a longtime but now former source for Soter, then the patchwork of parcels of Willakenzie Estate, whose name comes from the soil series of ocean sediments this region is known for. Moving south, there's the Deux Vert Vineyard, notable for some unusual grapes for this area, including syrah. I'm guessing this is a warm microclimate. Then the large Yamhela Vineyard, and to the southeast the very well known Shea Vineyard. You can see that Shea is actually two distinct parcels, which are further broken into numbered blocks that go to specific producers. In Burgundy, Shea might be an entire appellation. Here, it's all one site. But there are some big differences in the blocks. Check out more detail here. Moving back to the southwest toward the town of Carlton, we find a northwest to southeast ridge with some of the most attractive sites in the whole AVA. Near the town of Yamhill, there's the Blackburn Road corridor, with the long planted Wahle Vineyard, where I got grapes for my homemade wine in 2006. Also, Stag Hollow and at the east end of the road, Ken Wright's estate Savoya Vineyard. This is a nice neighborhood for Yamhill-Carlton Pinot Noir. To the south, there's the beautiful slope of Belle Pente and a few sites of Lemelson, anchored by the Stermer Vineyard. Finally, due west of the Dundee Hills AVA, there are sites like Mineral Springs -- Soter's new estate vineyard -- Abbott's Claim, Bayliss, Monks Gate, all the way down to the Anne Amie Estate Vineyard almost on the border of the town of Lafayette. Last time, I detailed a bit about the large Chehalem Mountains AVA. I also wrote about how the small Ribbon Ridge AVA is included on the Chehalem Mountains map. So let's look at Ribbon Ridge more closely. Looking at the Chehalem Mountains AVA map, you might wonder why Ribbon Ridge is a separate AVA. The federal ruling that established Ribbon Ridge as its own AVA can tell you more about that than I can. In short, its sedimentary soils are geologically different from the more volcanic Chehalem Mountains. Also, dramatic topography separates Ribbon Ridge from the Yamhill-Carlton district to the west, though the soils are more similar between those two AVAs. Ribbon Ridge is described as an "island" on the AVA ruling document, and looking closely on this map you can see that. From Ayers Creek to the north and Dopp Creek to the east, then down to the Chehalem Creek to the west and south, Ribbon Ridge really does stand out. The effect is to create a bit of a rain and wind shadow (if that's a term) that allows the region to be a bit warmer, drier and less foggy than some surrounding areas. The paved entrance to the AVA from the south is Lewis Rogers Lane, not marked on the map but running north from North Valley Road between Dopp Road to the east and the gravel and dirt Ribbon Ridge Road to the west. The map shows Armstrong Vineyard on the right but doesn't show the newly planted Ackerman Vineyard just to the north. Further up, the road bends left at Ayers Vineyard, then right at Brick House, one of the most recognized names in this area. Also in this area is the Ribbon Ridge Estate vineyard of Aramenta Cellars and their Looney Vineyard, leased to Archery Summit in the Dundee Hills. A bit further on, Lewis Rogers Lane intersects with Ribbon Ridge Road, which climbs higher into the AVA. There's the new Trisaetum Vineyard on the left, then Redman and Styring before you reach Chehalem winery's well known Ridgecrest Vineyard. The far west end of Ribbon Ridge isn't accessible up this way, but has some highly regarded sites. From North Valley Road, there's Patty Green's Estate vineyard, the old Autumn Wind property. Also you find The Beaux Freres Vineyard, Whistling Ridge Vineyard, The Upper Terrace of Beaux Freres, and something I didn't know about until seeing this map -- Bryce Vineyard, no doubt from the late, great Bryce Bagnall who's eponymous label carries on without him. Next time, the Yamhill-Carlton district. After the Dundee Hills and McMinnville AVAs, let’s turn our attentions to Chehalem Mountains. Find a copy of the Chehalem Mountains AVA map from the Oregon Wine Board and The Map Store here. When you look over this large area, a few things become clear. First, there are two American Viticultural Areas detailed here, Chehalem Mountains and Ribbon Ridge. Second, Chehalem Mountains is a sprawling AVA with three or four subregions and varying soil types of volcanic and sedimentary orgin. Third, Ribbon Ridge is the distinct north/south flank tucked into the western edge of the Chehalem Mountains. The Chehalem Mountains AVA begins in the south with Parrett Mountain, an old basalt pile with some of the rockiest vineyards in all of the northern Willamette Valley. Previously I wrote about the diversity of the Le Cadeau Vineyard. I’m also a fan of McKinlay wine, so check out the two pieces of McKinlay vineyard as well as the Ladd Hill Vineyard also bottled by that producer. Other vineyards that catch my eye are J.K. Carriere, the very high quality label produced by Jim Prosser, and Carabella vineyard, a label I’ve never tried but one I notice more and more I notice in others’ bottlings, such as Dedaleus. Before seeing this map, I didn’t know that Lemelson, over in the Yamhill-Carlton district, has the Chestnut Hill Vineyard here. Moving north, the next subregion is, for lack of a better term, the Oregon Highway 99W corridor. In here I’ll place Chehalem winery’s Corral Creek vineyard, Rex Hill, the newer Nicholas vineyard, and the vastly increased plantings of the Pamplin Family / Anne Amie on Bell Road that aren’t exactly shown completely on this map. From the Pamplin Family Winery and the more established Marylin Vineyard, newer plantings that seem to be labeled as Justin Grant and Louise (not to be confused with Cristom’s Louise vineyard) actually wrap all around from Marylin. If you take the Bell Road short cut from 99W over to North Valley Road, in this area you’ll see my favorite unplanted site. It’s the top of the hill above Bell Road where the road wraps around, directly above where August Cellars Vyd is printed on the map. (You have to love those topo lines on these maps.) Currently it all looks like hay, but someday perhaps it will be vines. What an exposure. Now to the west, along North Valley Road to the next subregion, the southern flank of the Chehalem Mountains proper. First, at Springbrook Road there’s a vineyard I’ve long observed without knowing whose it was. Until now. It’s the Ellis Vineyard of Adelsheim, I think half pinot noir and half I’m guessing chardonnay. Then the tiny Le Privé vineyard and the notably steep Medici vineyard. You can see it from Newberg; it runs high up a direct south slope. Beautiful, but probably tough farming. Then along North Valley Road (watch your speed, even if it’s straight). There’s a bench at the base of the steeper mountain slope with well known sites such as Rex Hill’s Jacob-Hart, various Adelsheim sites, Vidon, and further along, Adelsheim’s home vineyard, Bergstrom’s de Lancellotti, and, naturally, the respected Chehalem Mountain Vineyard. The rest of Chehalem Mountains is the more remote northern area, truly the most sprawling. From the east, there are sites made notable by Siduri wines in Santa Rosa, CA. Siduri’s made Oregon wine down south for more than a decade, these days mostly from Aubre Vert (misnamed “Arbre Vert” here), Hawks View, Shaw Mountain (not shown, but also off Edy Road), and more recently Beran Vineyard to the northwest. The rest of that northern area of the AVA is sporadically planted, with some small Ponzi vineyards, Gypsy Dancer from the former owners of Archery Summit in the Dundee Hills, and a few others I honestly have never heard of. Beyond the AVA boundaries to the northeast, you’ll also notice a few sites from Cooper Mountain Vineyards, and the original Ponzi Estate Vineyard, just outside of Beaverton. Next time, a closer look at Ribbon Ridge. A number of readers contacted me after my last post about the Dundee Hills vineyard map. Looks like I'm not the only map geek out there, which is good. Hannelore Buckenmeyer of the Oregon Wine Board saw the post and filled me in on some details about the map project. Buckenmeyer wrote to tell me that the OWB "partnered with The Map Store to produce these AVA maps." Buckenmeyer responded to the fact that some vineyards, including older, prominent plantings, are missing from the maps. She wrote, "The OWB conducted meetings and workshops, sent out email and direct mail, and worked with regional winery organizations to encourage participation. However, as you noted, some people either didn't hear about the project or decided not to participate." Interesting. I'm inclined to contact at least a few of these vineyards and get them on board. Is there a cost to participate? Are there other concerns that kept a few owners from participating? Perhaps, but I can't help thinking that so many vineyards participated that those few who didn't are really the ones missing out. Jordan Thomas, who wrote to say that she worked on the production of these maps, echoed something I heard from Buckenmeyer. Thomas wrote that these maps are "a work in progress," and that they'll be updated on an annual basis. Perhaps best of all, Thomas provided a link to a Google Earth-based application where you can see The Map Store's "entire database of vineyard and winery information in 3D." Check it out here. Special thanks to Buckenmeyer and the OWB for providing me some samples of the maps. They are gorgeous, very informative, and worth framing. I have no financial interest here, but if you like Oregon wine and like maps, buy these maps. With that in mind, a few words about the McMinnville AVA map. This emerging district has fewer sites planted than any other local AVA, all to the southwest of the town that gives the district its name. Vineyards in this district are exclusively on the largely volcanic soils of the foothills of the coast range. The hills run southwest to northeast, with lots of south, west and east exposures. The key issue here for viticulture are the winds from the Van Duzer corridor to the west, a low gap through the coast range that allows cool winds to blow. That and some moderate to high elevation make for a cool growing climate, more beneficial in warmer years. With their usually high acids, wines from this district never lack color. The pinot noir wines here often have beautiful aromas if not always the fleshiest of textures, which is ideal for those who like a bit more structure in their wines. Despite its relatively small size, there are a few exceptional vineyards in the McMinnville district. Meredith Mitchell was planted in 1988 on own-rooted Pommard clone and is bottled by a number of high quality producers. Momtazi is a large (and growing) planting of the Maysara winery and is bottled by many other producers. Hyland vineyard, one of the oldest plantings in Oregon, was recently sold to the Northwest Wine Co. led by Laurent Montalieu. I'm not sure if these grapes will continue to go to old clients, but I hope so. Hyland particularly has some prized old riesling vines. If you're want this and other maps, here's the link to Sonoma-based The Map Store's Oregon AVA Maps page. I'll write more about the other AVAs in the coming days. I'm crazy for maps. I get it from my dad, who showed me at an early age how to read road maps on family car trips. My passion (perhaps fetish) comes in handy with my interest in wine. Many wine lovers enjoy looking at maps of their favorite regions. The bible of this pursuit has long been Johnson's - and now Robinson's - World Atlas of Wine. If you like wine and maps and you don't have this book, get it. However, as great as that book is, beyond Burgundy and a few other selected areas, you simply don't get much in the way of vineyard definition in the maps. Rather, you get regional distinction of where one general town or even sub-region of an appellation lies in relation to another. Chianti Ruffina is here, Chianti Colli-Sensi is there, and hey, I can see some specific and usually accurate locations of some of my favorite producers. That's cool, but not enough. Things are particularly difficult when you try to see maps of the AVAs and individual vineyards of, say, Oregon, up close and personal as it were. Well those days are over. After much searching, I've found online maps of Oregon vineyards by AVA that are among the best I've ever seen. Fans of Oregon wine have long known about the vineyard map of Yamhill County, which is pretty cool if out of date. Same too with the old Eola Hills map I've linked to on this site for a while. There's a new one that's better, but still limited. Then there are the maps at The Map Store. I haven't even searched through the whole site. I imagine there are terrific things from other locales. I'm simply too focused on Oregon, so far. Case in point, the Dundee Hills. The AVA, or appellation, where it all started for Oregon pinot noir. Check out the free Dundee Hills map (you'll need adobe acrobat to view it). It's not a big map, but you can zoom in for terrific detail. There's the elusive Thomas vineyard in the northwest corner of the boundary. And the Anderson Family vineyard in the northeast. Or the Oracle vineyard that I believe is fully owned by Westry. No map is perfect, and there are glaring errors or omissions that do make purchasing larger copies of these maps a bit questionable. Where's Abbey Ridge? It should be just south of Oracle. Not there. Where's Maresh? Between Knudsen and Arcus. But again, not on this map. It's strange, I admit. These maps are so good, yet have a few glaring, GLARING, errors. Nevertheless, with the topo lines and the otherwise fantastic detail, these maps are terrific resources for Oregon wine geeks. In the near future, I'll post on the other AVAs covered by the Map Store. Even with the flaws, the maps are worthwhile. Let me know if you find any issues that I haven't seen or mentioned here. Just a quick note to say that the NV Segura Viudas Brut Reserva Heredad is indeed terrific Cava, or Spanish sparkling wine. You may recognize the name Segura Viudas from their ubiquitous budget brut that I wrote about a few months ago. At least I think I wrote about it. Where's that post? Anyway, that wine is usually $8 or less and is a nice buy in cheap bubbly. It's a definite step up to its parent company's Frexinet bottlings. 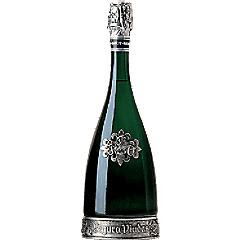 The Brut Reserva Heredad is the fanciest bottling, and it comes in a peculiar bottle. Yes, that's pewter around the bottom and stuck on the middle. Not exactly eco-friendly disposable packaging. How am I supposed to recycle this? According to marketing literature I see online, the pewter keeps the wine chilled. I don't think so, and judging by the "hand blown" bottle claim (then why's there a seam in the glass? ), I wouldn't exactly trust what I read from the producer. But it's in the glass that counts, right? And this wine delivers. It has a pale greenish gold color, with a fragrant aroma of green apples, biscuits and mushrooms. The flavors are at once rich and lean, with nice length and lots of detail amid the somewhat loud flavor profile. Can I wine be obvious and subtle at once? The grapes here are macabeo and parellada, which normally give a very fruit-driven wine. Here, better source material and perhaps some bottle age really do lend a more Champagne-like sense to the wine. Very nice stuff, and a good value around $20 if you can get around the pewter.